who can tell me how to use the <-defineTemplayte -useTemplate -docTag >?? I have some problem with build UI. I use MEL for it. When I run comands from script editor, All is ok, brilliance. But, if i use userSutup.mel , it does not work. How would one build this in MEL? I’ve almost finished an asset manager but want a better system to browse through folders like the one above? It’s a problem about your UI refreshing too fast and overriding your custom menu. We had one similar here too. Hamburger : I’m really not sure you can do this in MEL. This is pure Qt widget. To do simalr things i think you will have no choice than use textScrollList, good luck!!! How can I make a pane size “stick” in place? The paneLayout -command only has a flag for defining a % value. I want one pane to be exactly X pixels in width and I have no clue how to do that. Even if I set the pane widths to 1 and 99 (pane 1 and 2) pane 1 gets much larger than the child elements it contains!! i used this layout to put all scripts that i have collected (from highend and simplymaya, and some scripts of jason.) into one window. note that the -scr flag makes your tab layout sctollable. and here’s the zip file of the ui that i did. QTTabWidget.setPosition(‘South’) would make the tabs appear on the bottom. North, West and East are also valid options. // Set up the attachments. //-attachControl $gMyToolsButton  left   0 $gLayerEditorButton	// Why this don't working? Hi. I’m back to studying Python. Now reading up on classes and how to utilize it with UI:s.
I’m having some problems figuring out how to get exactly what I want though and so I turn to you. Tried parenting the button to the mainForm instead and sure, that works, but I want it to be attached under the tab layout. By editing the base class, the elements resize according to the formLayout settings. Anyone could shed some light on this? I’m posting both the edited class and my full inherited one for you to try. I am completely stumped with this. I’m trying to build a character control GUI with a background image and buttons or some other clickable object laid over the top but I can’t get it working. The buttons are not clickable and behind the image and I have no idea why. I’ve basically pieced this code together from other character gui’s so I’m at a loss. Any help would be appreciated. Try creating the buttons after the image. Thanks, but I still can’t figure it out. I did as you suggested but the buttons are still behind the image. It seems that no matter what order I put the buttons and the image, the image is always in front. Is there anything else I could be missing? Edit: Curiously if I instead use a symbolButton for the background image but have “-enable 0” so it cannot be clicked the control buttons are placed in front and work fine. The problem with this is “-enable 0” makes the image black and white. hello. im Gabriela and i would like your help to have a job that could help me. 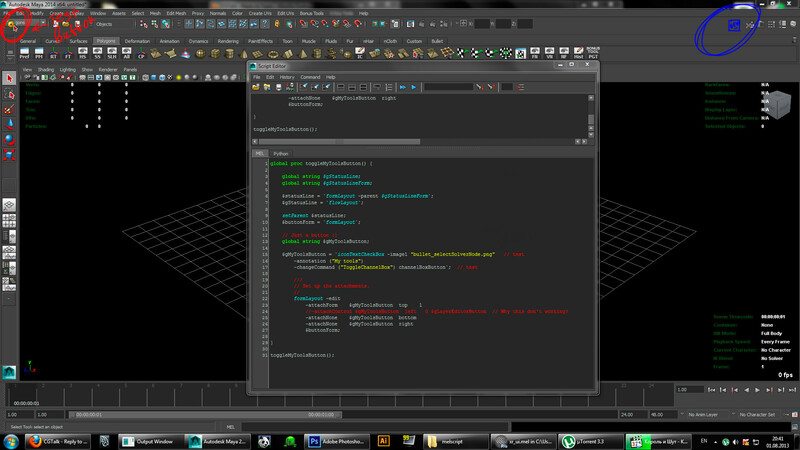 work is autodesk maya mel proxy. We are not going to do your homework for you. Post code so we can see what you are struggling with. Maya gui trivia: somebody knows how to hide the x button in a widget so users cannot close them? Or make hitting that button crash save? I’m learning to use Python in Maya and I’ve got a simple question. Im creating a UI window code where Im setting the pivot = of a .nurbsCube(). I created this Float Field Group that has 3 value fields. However, when I do this the function only returns a single float (value1) instead of all three values, so how can I fix this? To ‘set’ the value you need to ‘edit’ the floatFieldGrp, ‘Query’ returns the existing values.